Was born in Baku in 1912. 1937 — Graduated from the Yerevan Polytechnic Institute. 1934 — His first cartoon was published in the Izvestia newspaper. 1935 — Began to be published in the republican and all-Union press as a cartoonist. 1939-1948 — Main artist of the G. Sundukyan Academical Theatre. Worked at the Leninakan Theatre. 1951-1959 — Executive Secretary of the Armenian Artists Union. 1956 — Honored Artist of Armenia. 1954-1964 — Main artist in the Vozni (Hedgehog) republican satirical magazine. 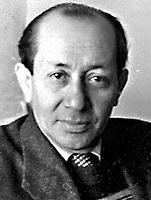 1964— National Artist of Armenia. His personal cartoon and poster exhibitions were held in Prague, Moscow, Tallinn, Yerevan.